Tom Kita Chara Lodge holds three main events annually: the Winter Banquet, the Brotherhood Clinic and Fall Conference. We also send a contingent to the section’s annual event.. There is now a new tradition started of a yearly community service project. 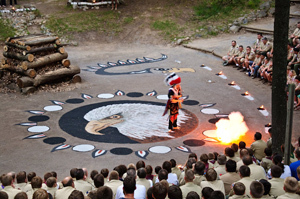 Some of the most exciting elements of the the Order of the Arrow program are the lodge and national events. These provide excitement, inspriation and fun to OA members and Scouting. We hope to see you at one or more of our events this year. Section C-1B covers five councils in the upper-Midwest: Bay-Lakes, Samoset, Chippewa Valley, Gateway Area, and Gamehaven. Each of those have a lodge: Kon Wapos, Tom Kita Chara, Otyokwa, Ni-Sanak-Tani, and Blue Ox, respectively. With a total of more than 3,500 youth and adults, Section C-1B is one of the larger sections in the Central Region.